FINE GAEL’S POPULARITY doesn’t appear to have been impacted by the Cervical Check scandal over recent weeks. Leo Varadkar’s party remains the most popular in the country. They’re up two points to 34% in the latest Red C opinion poll for the Sunday Business Post. Sinn Féin also rise in this latest survey – up 2% to 16% compared to last month’s poll. There’s no change for either Fianna Fáil or Labour, who remain on 25% and 6% respectively. The Independent Alliance grouping is up two points to 4%, with Solidarity-People Before Profit at 3% (up one) and the Social Democrats at 1% (down one). 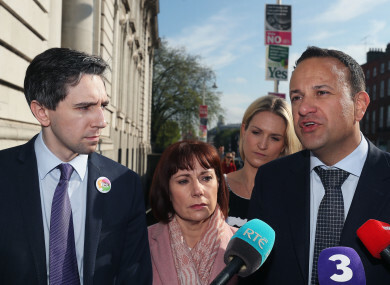 The Greens remain at 2% while Renua, the only political party running a united campaign for a No vote in the upcoming abortion referendum, have dropped from 1% support down to zero. Other independents are at 9% (down 4 from the last poll). The telephone poll was carried out among 1,000 adults between Thursday 10 May and Wednesday last. The paper will also carry results of an opinion poll on the Eighth Amendment referendum – likely one of the last to be published before polling day – but the results of that aren’t being released this evening. The latest national poll on the issue, published in the Irish Times on Thursday, showed support for removal of the Eighth Amendment at 58% to 42% once undecideds are excluded. Including those yet to make up their minds, the Yes vote was placed at 44% with the No vote at 32% and 17% undecided. 7% said they would not vote or declined to say. Email “Up in the polls: The Cervical Check scandal hasn't dented support for Fine Gael ”. Feedback on “Up in the polls: The Cervical Check scandal hasn't dented support for Fine Gael ”.